I used my Alison Glass charms for the first time over the weekend to make a mini mini quilt to gift to a Patron who just unlocked the mini mini quilt reward. The patron mentioned that she liked rainbows, purples, and free motion quilting. With the mention of rainbows, I couldn’t help but think of my Alison Glass charms, and I immediately started looking for a fun design that I could shrink down to super miniature size. I came across Rachel @Stitched in Color’s Rainbow Bricks mini quilt from 2015 and I knew I could make that work. The background fabric is a white on white Sunprint Text print, which doesn’t show through in these photos. 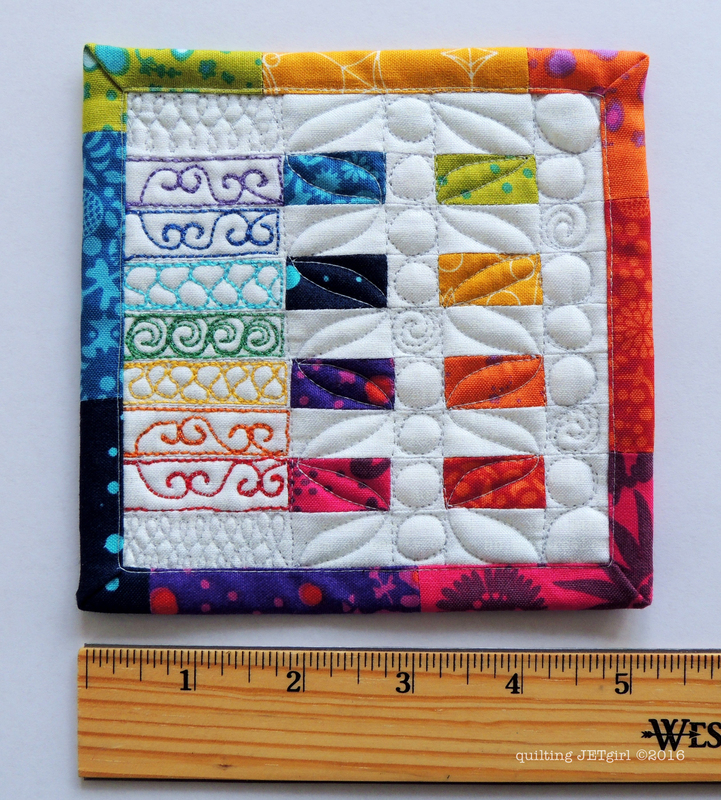 Other than the thread and batting, this mini mini quilt is *all* Alison Glass! The piecing of the mini quilt top wasn’t the most exciting piecing work, but I hope that my free motion quilting (including the use of a rainbow of Aurifl 12wt thread on the side) and the rainbow binding really pulls it all together into a fun punch of beauty in only 5-inches square. For the most part I quilted and stitched down the binding using 50wt Aurifil 2600 (Dove). 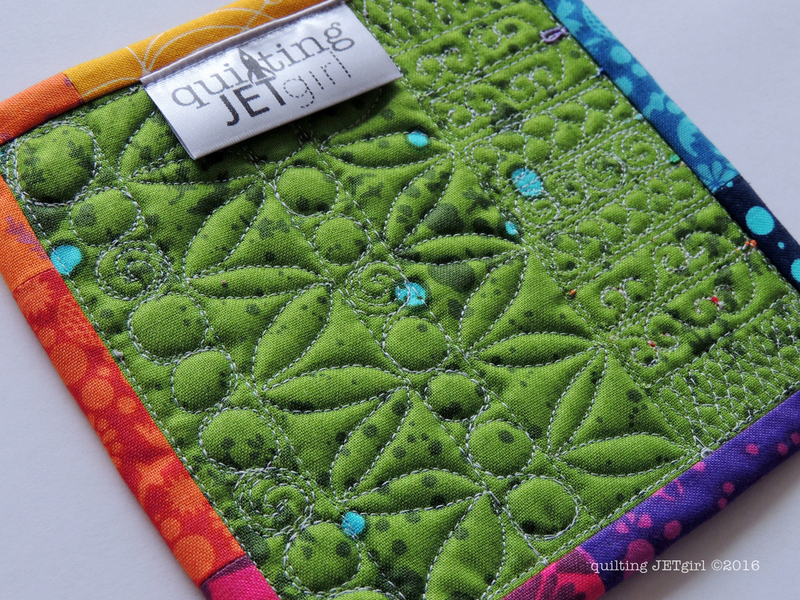 I was thrilled with how my new Juki performed with tiny free motion quilting detail, and even more excited that with a simple needle change (I upsided from an 80/12 to a 110/18 needle) that I could free motion quilt with 12wt thread through the needle! I am definitely loving my new sewing machine. I kept 50wt 2600 (Dove) in the bobbin when I was free motion quilting with the heavier thread, and I did not adjust the tension at all. In general, I would recommend matching the bobbin thread color to the top thread color, but for such tiny accent areas, I decided that the shortcut was OK in this instance. Even the backing of the mini is an Alison Glass print from the charm swap! I still have at least one more Alison Glass make that I want to have done in time to share for the Quilting Jetgirl Alison Glass Challenge linkup in January. Have you started planning what you are going to make to link up? Your mini is just charming. Sorry – no coffee yet. I love your rainbow binding, too. I have my Alison Glass quilt all planned out, I’m just weighing my background options. Wow. The quilting…amazing. I’m sure it will be very much appreciated. The binding is such a perfect frame, and the quilting is very “you.” Your Patron will be thrilled! This is very beautiful and I’m happy for the person who will receive it. I’m sure she will love it. Constantly planning my Alison Glass as I’m working on other things. It’s a beautiful mini! Despite the size, there is such a lot to look at – the eye just keeps going round taking in all th cute details. 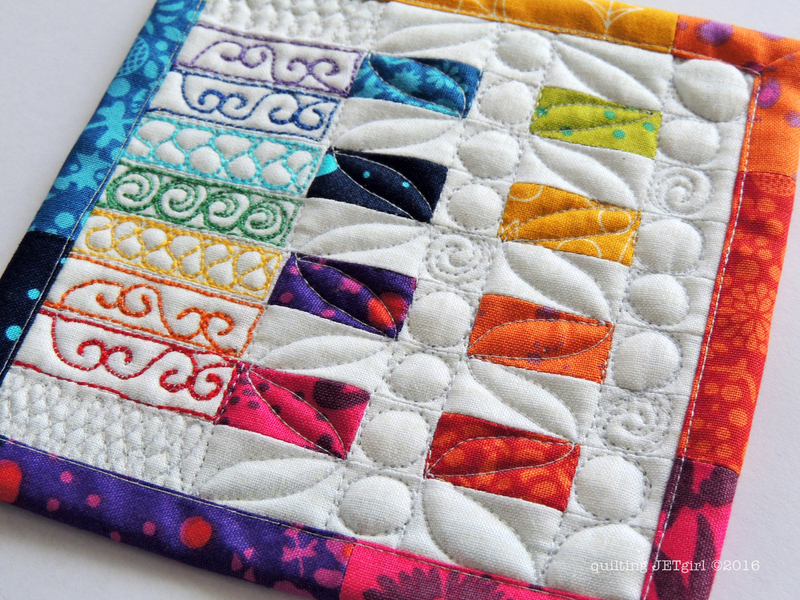 The perfect combination of rainbow, alison glass and quilting! It is super cute!! Another amazing mini mini! Your patron will be blown away with this little beauty. So good to hear your new Juki is all you hoped it would be. Thank you for the Aurifil 12 needle info. I accidentally ordered 2 large spools of 12 weight. I am now going to see if I can enhance some of my Christmas projects using 12 weight threads. I liked the first showing, I LOVE the finished article!! What I think is…….that you are amazing. I found you only a few weeks ago, I enjoy your ideas, work and writing. Thank you for sharing. I loved the way this mini mini finished! Your quilting with the 12 weight has inspired me to try that soon. I’ve also been watching your Juki experience with interest, because I am in the market for a new machine. Thanks for sharing! So pretty and so small with lots of fun quilting on it. Very nice! The mini is just darling! I just love the detail in the quilting! Great job! I’m in love with this mini mini! It is just perfect! Yay for rainbows and yay for loving your new Juki! 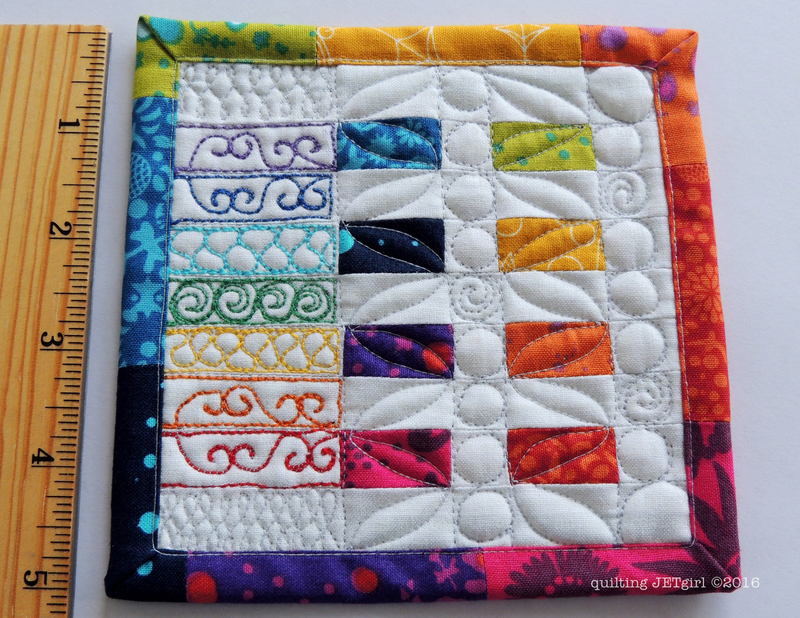 Your rainbow quilting and binding are fabulous touches Yvonne! This is amazing how much you packed into such a small quilt. Lovely. Your quilting is tiny in places and with the strong colours in places there is no hiding place, but you don’t need one as it only shows the perfection. That is tiny and oh so cute! Great job on the mini mini. Very pretty! I love your quilting 🙂 I’m glad to hear you’re happy with the new machine. I love everything about this quilt, the prints, colors, quilting, and scrappy binding! So cute! Nice, so culorful and cheery! Makes me want to try different weights of Aurifil other than 50 wt! This turned out super pretty, and I am so impressed with the 12wt fmq, that is not easy or fast to do!